Crate & Barrel Easter Stencils. There are certain foody stores that I am hard pressed to leave without having hemorrhaged my precious earnings from my precious paycheck. Crate & Barrel is not usually as one of those stores. It always seems like a lot of things in that store can be found for fraction of the cost at other stores. But for some reason these stencils jumped out at me during a recent visit. I know that I can make stencils pretty easily with plastic canister tops and cookie cutters, but I really like the look. The price was under $5 and I thought I was okay with spending just a little. 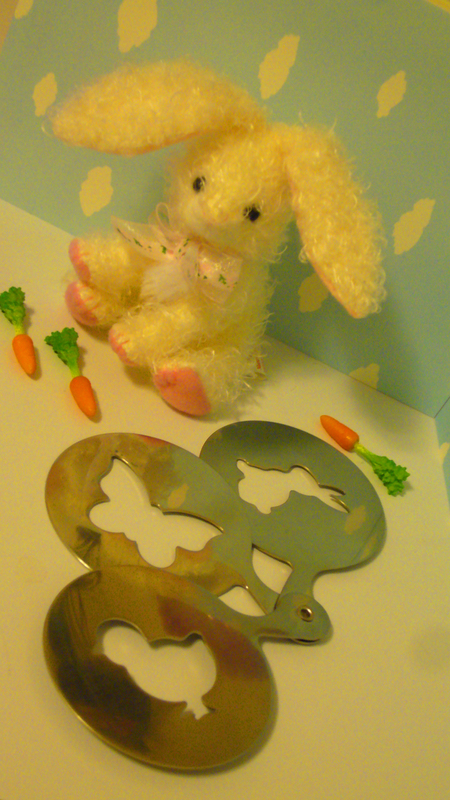 The stencil patterns are a rabbit ,a butterfly and a chick. They are staple Easter patterns and so very cute. It might have been an impulse purchase, but when pondering on my possible buyers regret I come back with a vision of me buying them all over again every time. ← Wine Tasting Party Anyone?